Be the first to hear about their new releases and deals. Download the Booksprout app and search for Asher Elkayam today! 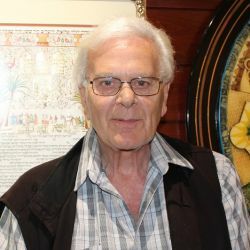 A former student of the Hebrew University of Jerusalem and Alliance High School in Haifa, Israel, Asher Elkayam studied Hebrew morphology, the Bible and Talmud. He is the author of “The Bible, The Power of the Word,” “The Qur’an and Biblical Origins” and “Love and Romance in the Bible.” He studied comparative religions and previously wrote two books on the subject, “Whose God is it Anyway” and “Jesus Returns and Faces Moses.” Elkayam is a multilingual and multidisciplinary scholar. Besides his Hebrew, Bible and Talmud knowledge, Elkayam is also a French and Hebrew teacher, a graduate of the Political Science Institute of Strasbourg, France, and a graduate of Towson University in education. He is also a graduate of the American Council of Audioprosthology. Readers can follow Elkayam at www.asherauthor.com and www.asherelkayam.weebly.com.